WIN PRIZES! Submit either a funny ringtone file created with one of our TEXT-TO-SPEECH Ringtone Apps or a video showing how you use 100sounds! Win your choice of cases, earbuds, headphones and more! Email the file to us, or if it is too big, upload to http://public.me.com/toddbernhard and email us at info@NoTieSoftware.com to let us know what the filename is and where to send the prize! Prizes include cases from OtterBox or Speck, headphones and earbuds from ZAGG, each worth $30 to $80! Check out Todd Bernhard's blog on iPhone Life Magazine! Mr. Bernhard, our founder, is a contributing editor for both the print and online publication! Make a fashion statement with your own NO TIE T-shirt! Ties serve no real purpose. We value functionality over the superficial. 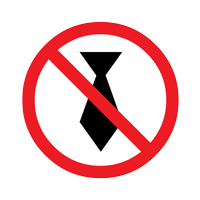 Join us and wear the No Tie shirt with pride! A great resource for assistive technology including software and hardware such as mounts, cases, pointing sticks for your iPad and more! The FUN way to stay informed! Featuring the best in editorial cartoons, humor columns and fake news, the Humor Times mercilessly lampoons lame politicians at every opportunity! Shows up in your mailbox once a month. Visit HumorTimes.com and order a free sample or a (cheap) subscription! © 2008 - 2019, No Tie LLC. All Rights Reserved.